and distribution systems against advance payment, helping choose the ad agency and defining the pricing strategy, SamsikaTM did it all. The reception? Love at first taste. 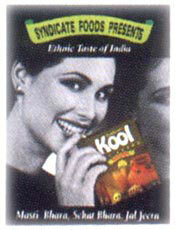 After its initial acceptance, Kool Jal JeeraTM is poised to take off both nationally and internationally. Tea times will never be the same again. Because with the introduction of Ayur Neem TeaTM, tea now has the additional flavour and the medicinal qualities of neem. Farmocopia came to SamsikaTM to launch its neem tea brand in the Indian market. SamsikaTM formulated the entire integrated marketing strategy for the brand to set up base in India. Since Ayur Neem TeaTM was breaking new ground, SamsikaTM paid special attention to positioning and segmentation. Starting off with the pack design, SamsikaTM went on to define sales territories, oversee the appointment of a sales force and set up the distribution network. The take-off was smooth and today Ayur Neem TeaTM is poised to carve a niche for itself in the market. Venturing out to conquer new horizons was the Adventure Group with its enviable real estate track record. The group was branching out into the leisure, resorts and clubs category and came to Samsika marketing ConsultantsTM for advice. The first step was to establish Adventure holidayTM. Then, through the Samsika brand Segmentation & Positioning ModuleTM, Samsika homed in on the locale Barwai, 45 km from the Mumbai airport. The idea is to have a world class club facility nestling in the hills and sculpted into the rocks, the stones and trees at Barwai. Samsika's contribution? The entire marketing strategy, the advertising brief, the sales and pricing strategy, including market research advice. As a result, Adventure country ResortTM of Barwai is in the process of becoming a destination worthy of being marked on the world tourist map and Adventure HolidayTM is being launched and setting the standard which no leisure resort has achieved before.